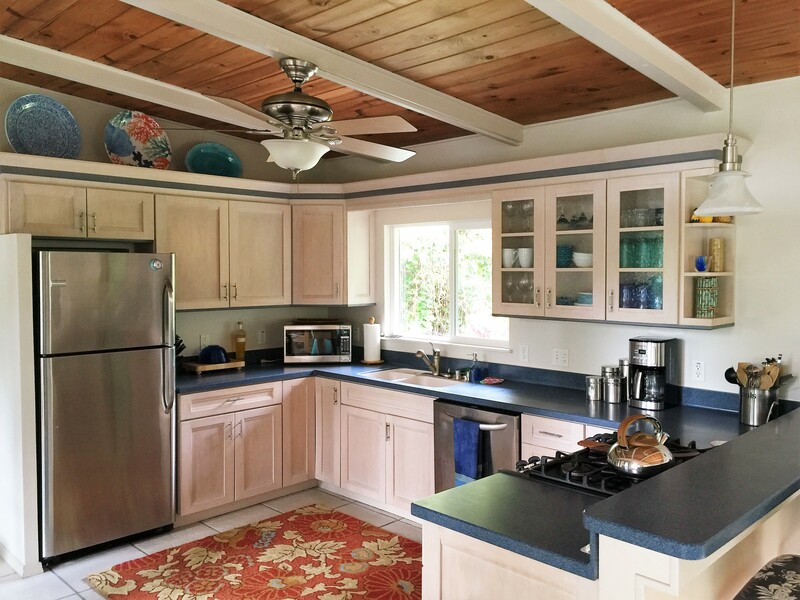 Our kitchen is set up with everything a professional Chef or a weekend cook would need to prepare an island feast. 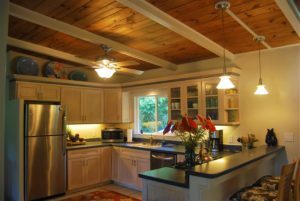 The kitchen is open to both the living room and the dining room. 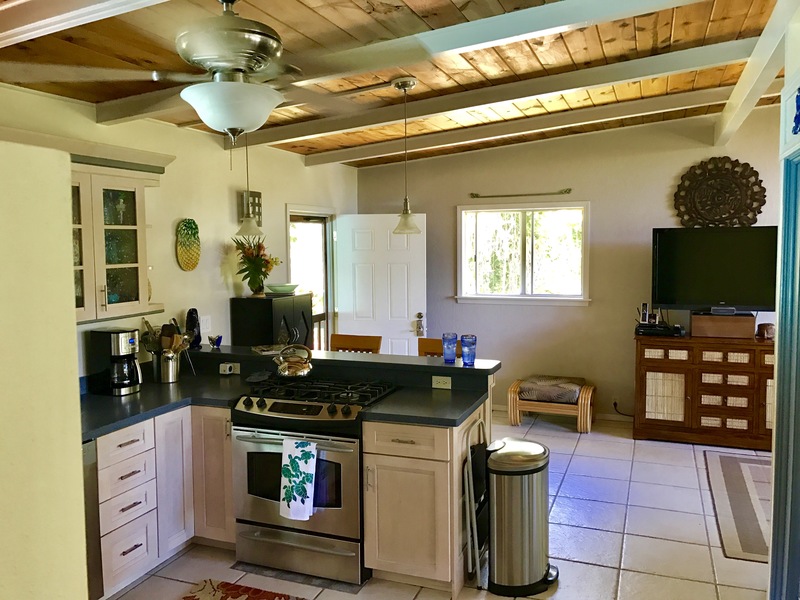 From the sink there is a nice view to the backyard and lower open lanai. 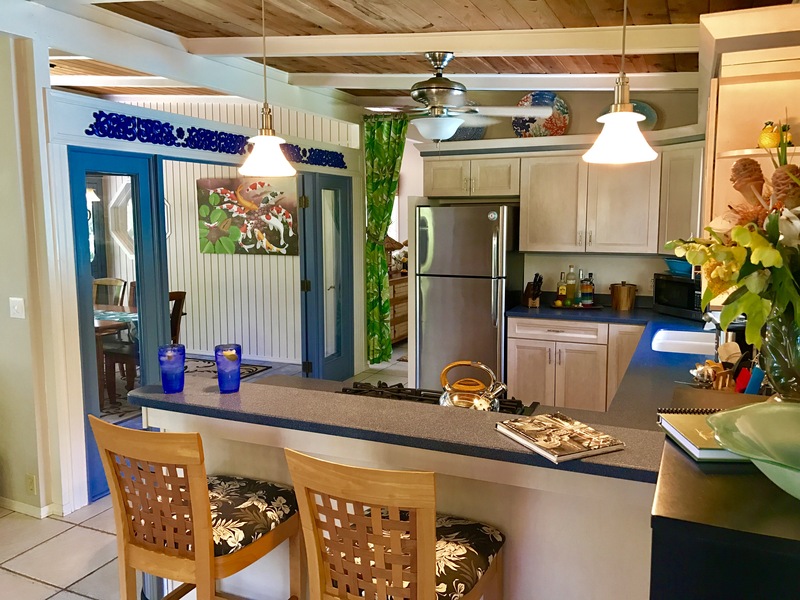 Easy access out the main entry door to the outdoor gas grill and the lanai dining table that seats four. The ceiling fan overhead helps keep you cool and comfortable when you are cooking. 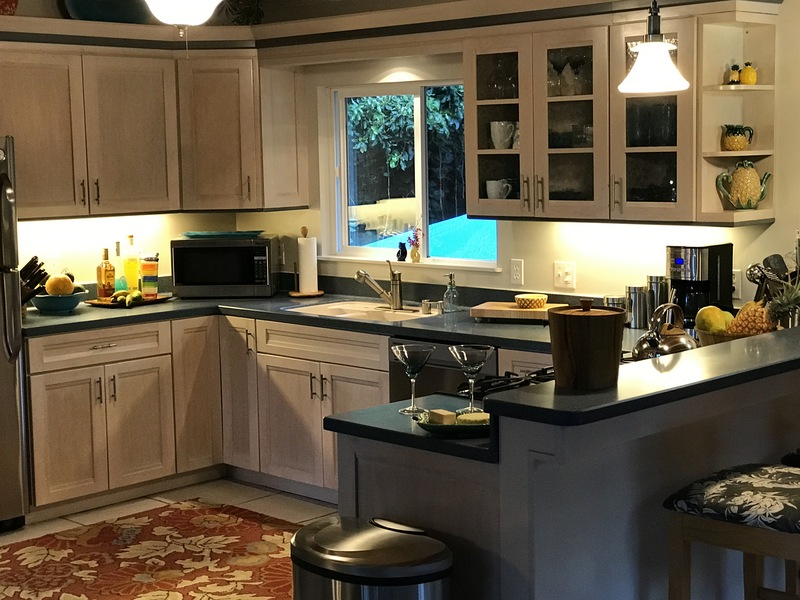 The kitchen is equipped with a Kenmore four burner gas cooktop and convection oven, Samsung stainless steel dishwasher and Frigidaire stainless steel refrigerator. 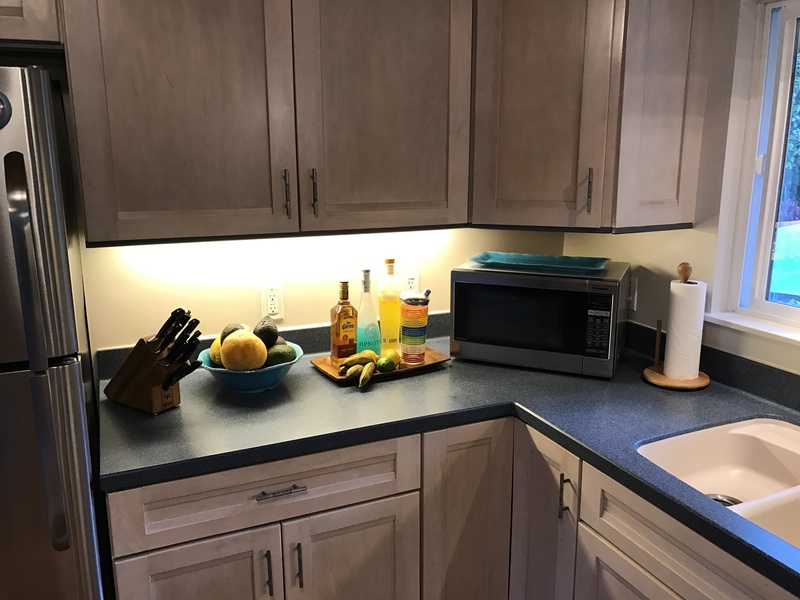 Outfitted with the following small appliances: micro wave, coffee maker in kitchen and one in the lower level master suite, blender, rice cooker, hand mixer, coffee bean grinder, crock pot and toaster. All the gadgets and tools you will need to prepare what you have discovered at the farmers market or at the fish store. A full knife block set of Wusthof chefs knifes, All Clad Cookware, prep bowls, bake ware, cutting boards, all to assist in helping to make your meal preparation easy and fun. 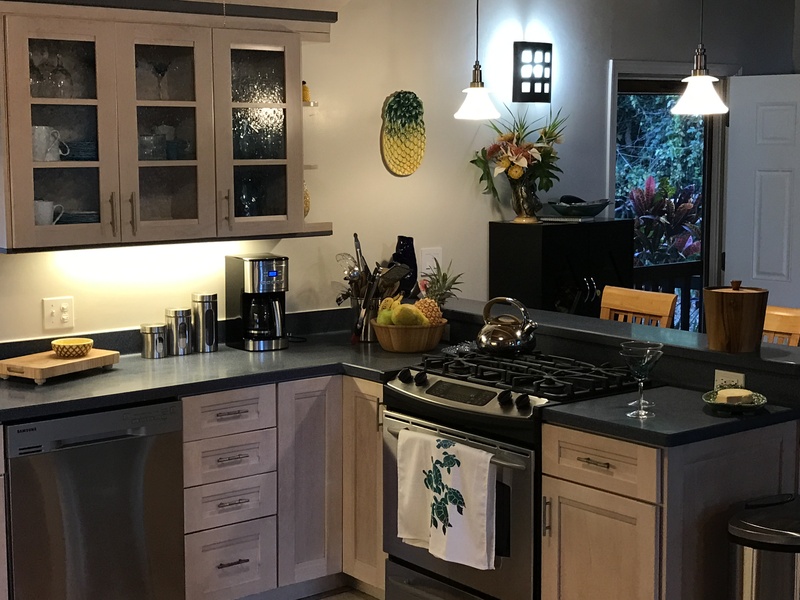 We have a variety of drinkware to use, from morning coffee cups, to wine & martini glasses, all to make the perfect tropical cocktail to end your day. You will find serving bowls and platters to lay out a great spread for yourself or your guests. 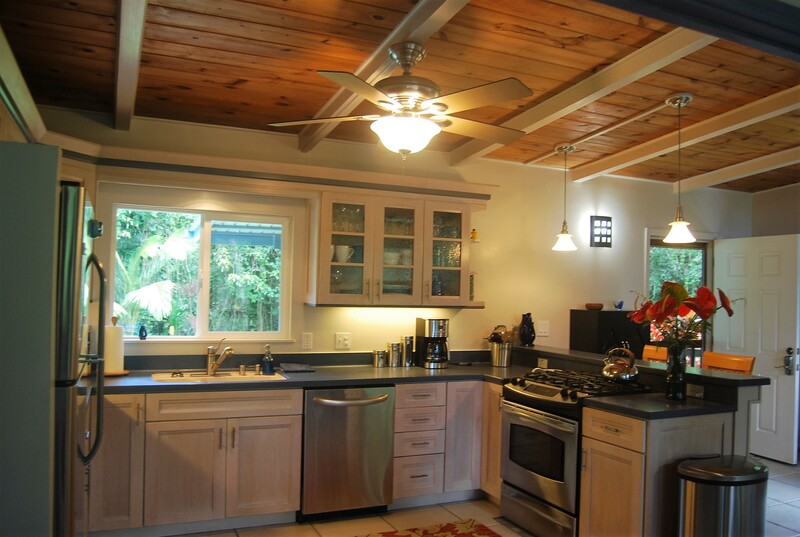 We hope you enjoy our kitchen as much as we do when we are here. 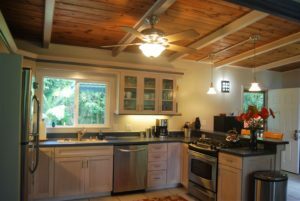 You can probably tell that we like to spend time in the kitchen and we wanted to stock our Hawaiian home with everything that we are accustomed to having in our Vermont Farmhouse kitchen.